Patrick loves words and telling stories. He writes for both adults and children. Creating for children allows him to share fun and funny stories with young people, and to work with an amazing illustrator to share their vision of a world that will excite and entertain. Anita works full time as a freelance illustrator. She has a strong passion for children related projects, so she was all over it when Patrick suggested that they should team up to create children’s books together. What does it mean to be a friend? To have a friend? 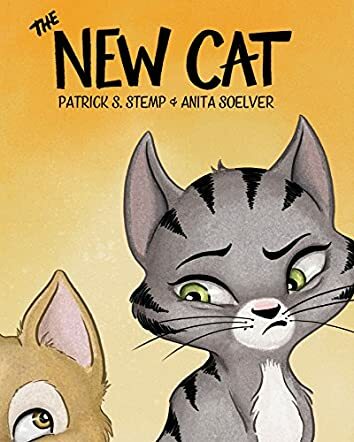 Cat is about to find out in The New Cat by Patrick S. Stemp. All of her life, Cat has enjoyed her family, her home and all of the good things she has been spoiled with. Quite often her family brings home new treats, new toys, new surprises for Cat to enjoy. One day, the family brings home a little bundle wrapped in a blanket. It's a puppy, but Cat doesn't know that. She calls it New Cat. There are a lot of things about New Cat that Cat doesn't understand. New Cat doesn't like Cat's favorite toy, a catnip ball; he doesn't like Cat's favorite food, canned fish; and he doesn't like to chase shadows, instead he goes for walks with the family outdoors. One thing New Cat does like is Cat's favorite napping spot on a rug in the sunshine. If there was just one thing that they had in common, Cat believes, they could be friends. Cat curls up next to New Cat and they share the favorite napping spot in the sun. Patrick S. Stemp has written a delightful story for young readers. The beautiful, colorful illustrations help lead the story along, inviting the young reader into the different worlds of Cat and New Cat. There is a lesson in this story, a lesson about accepting differences and trying hard to be friends with everyone. It is a simple lesson, one that everyone needs to learn - the importance of friendships and the importance of accepting other people's differences.